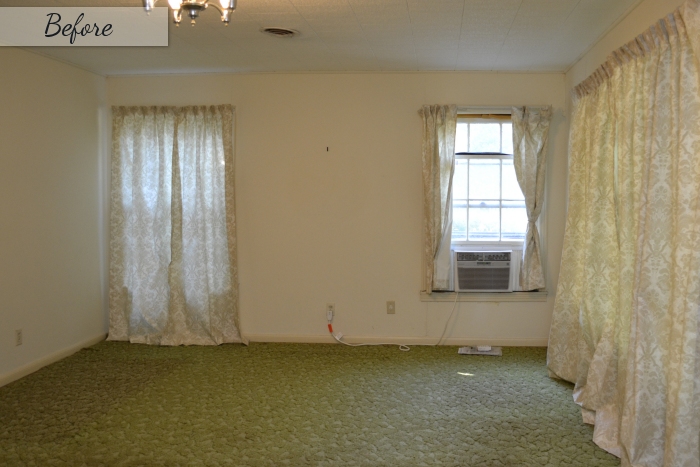 I was just looking at the “before” picture of my living room that I took when we closed on the house, and comparing it to how it looks today, and wanted to share my overall progress with you. Made a diamond tufted coffee table ottoman. You can get a quick view of the “before” and “progress” pictures by moving your mouse pointer on and off of the picture below (or tapping on and off on your mobile device). So what’s left in Phase 1? Plenty! Sew new sheers to replace the existing cheap sheers. Cover the shades on the floor lamps with new fabric. A green geometric print perhaps? Add pillows to the chairs. Accessorize the credenza, end tables, and ottoman. 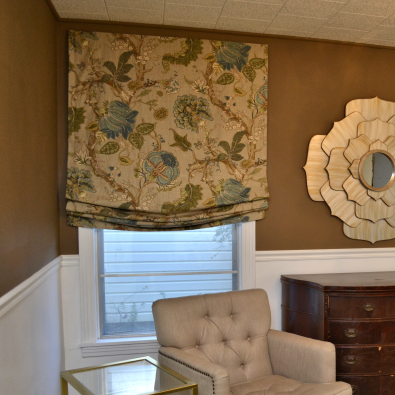 Raise the lotus mirror a bit…after accessorizing the credenza. There are certain things that I definitely want to do in this room that can’t be done until we level the foundation. All of those projects include things that are part of, or are attached to, the actual structure of the house. If I were to do them now, before leveling the foundation, they’d have to be repaired after the house is leveled. So for now, I’ll just concentrate on the furniture and accents that will all be part of the final room design. Removing the polystyrene ceiling tiles and the 1″ x 4″ pieces of lumber that they’re attached to, and repairing the ceiling. 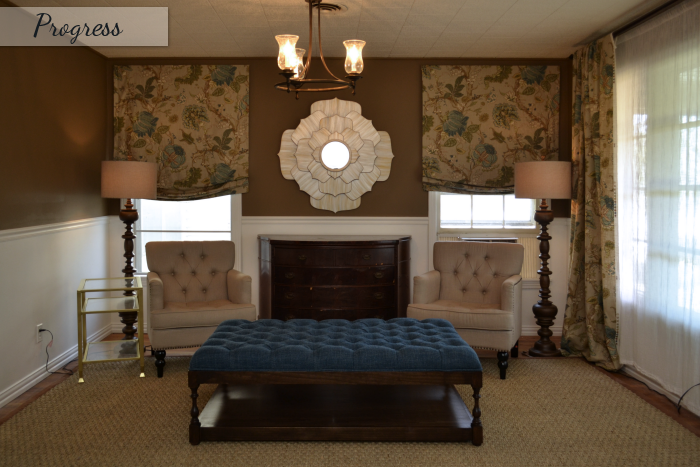 Adding recessed lights and centering the chandelier in the room. Adding a dividing wall with a very large opening between the entryway/living room and the original dining room. Replacing the one aluminum window with a wood window that matches the rest of the windows in the house. Adding wainscoting to the bottom half of the walls. Installing a fireplace where the credenza currently sits. Adding new trim around the windows and doors. Repairing the original wood windows so that they’re completely operational. Previous Post DIY Ottoman Coffee Table - FINISHED!! Whew, girl, I’m tired just reading it all too! But your progress so far is just phenomenal. It sure looks 300% better than it did before! You deserve a well-earned break. Question: If you build the fireplace where the credenza sits now, where will it go? I was wondering where the credenza would go too. To me when i think credenza i think by the front door so you can put stuff in it. It’ll probably go in the hallway. It fits perfectly in the area where the closet used to be that I ripped out. wowwie wow wow… LOVE the ottoman… love the room. Can’t wait for the next phase. What a transformation!! You are doing a fantastic job on this room! Looking forward to seeing the continued progress! had only 2 months to move and find a house in Al. I am doing basically the same thing you are doing except that I can’t purchase new items because even though this job (we prayed for a very long time) is wonderful, we still own another house that we still haven’t sold yet. So bills with it are still existing, (water, utility to show house and taxes and insurance). So one question I have is: Do you still own your Condo? How can I financially do the things I want to do and still stay on a very tight budget till we sell our other house? I sit here in Al in this new house and dream of what I can do, but, for now it’s just a dream….. I bought some beautiful chairs at a thrift store that are stripped RED with dark wood. 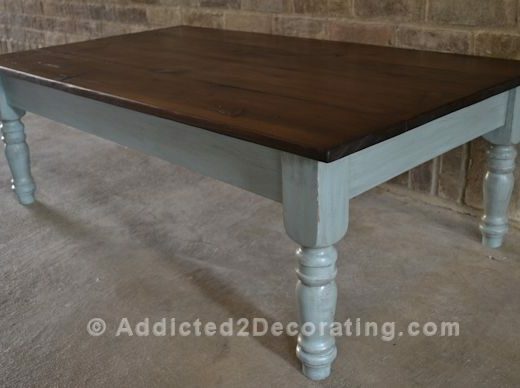 Can I paint the fabric with Annie Sloan paint and make them really pretty or should I just leave them alone till I can afford to recover?? What’s a girl to do?? We do still own our condo, but believe me…the reason I’m able to do all of this stuff isn’t because we’re just rolling in the money over here. 😀 It’s because our condo was incredibly cheap with an unbelievably low mortgage, and then we bought a really cheap house, put $20,000 down on it, which made our mortgage almost laughably low. Seriously, people can’t even rent a studio apartment in this area for what we pay on our house mortgage. So our two mortgages together still equal less than what most people pay for one mortgage. In fact, our combined mortgages right now are almost $400 less than our mortgage on our first house that we bought in Oregon eleven years ago. 😀 True story. In the meantime…YES…break out the chalk paint and get started on those chairs. Even if they don’t look just right, it’ll be an improvement, and you can always reupholster them in the future as funds allow. What is the size of the ottoman? It’s looks HUGE in the pic. Just curious. Thanks. We are in the foundation repair business. Email me if you are interested. We do free estimates in the southeast but I don’t know where you are located. Just curious…are you still loving the brown walls? Pics of the condo are on the right with all the light, bright blues and greens as I look at the new house. Such a difference between the two, so wondered if you were still happy with the change? They’re okay. But as I mentioned in the post, they’re temporary. The brown was always intended to be temporary. I haven’t really taken time to look yet, but I just have in mind some medium brown neutral grasscoth. It’ll definitely be much lighter than the walls currently are, but one thing I love about grasscloth is the variation of colors within the wallpaper. So it might have some hints of this dark brown throughout, but the overall color will be a much lighter brown or tan. Oh I love grasscloth! That would be beautiful! I can’t wait to see the room all done. It’s so much fun watching it from start to finish, and actually enjoying the process! Your transformation is amazing! Those window treatments are so great as is the ottoman. The whole room is looking sooooo good. (sorry to gush so much but I’m loving it a lot!) I like the shade color of your lamps but I’m sure your vision of the finished product will make a ‘believer’ of me. : ) Great job and enjoy your week! I love following you and this house! Fantastic! I look forward to the remaining projects for the room. If I could take take a week off from work, it would almost be worth it just to get out of the cold Maine weather and have a change of scenery! Perhaps I should pass along something a friend of mine says quite frequently, “Don’t you ever rest?” Um, no! Even if you use area rugs, you can always still see plenty of the hardwood floors. This (so far) is the only rug I have in the house. I may add more, but there will always be plenty of hardwood floor showing. OMG!!! That is amazing!!! You did such a wonderful job. I love the floors I see peaking out from under the rug, and the drapes, to die for!!! – Great job – KUDOS..
oh, wow. THIS. IS. AMAZING transformation, Kristi! As with the condo, you take a space nobody would glance twice at and make it into something beautiful, interesting, welcoming and comfortable. I love it. It’s so inspiring and fun to watch. I’ve been attempting to do a project or two from your blog…it’s hard work! I’m like “But Kristi made it look easy!” Oh well, I’m a beginner, I keep reminding myself it takes time. Can’t wait to see more progress unfold. Merry Christmas and Happy New Year! The ottoman came out amazing. I love the bottom shelf and the size in general. But so far my favorite item/project has to be the 40-inch-metallic-lotus-flower-mirror! PS I wish I had your time & energy! You know, I didn’t even feel sorry for you when I first saw the living room because you had such a promising vision. But I didn’t see it this good. You’re a jewel. Meanwhile, we’ll be patient and wait for next year. Love your creativity. I am always so inspired when I see what you have done! I especially like your do it yourself-ness and your attitude that it doesn’t have to be perfect, it will be an improvement. I think we hold back and don’t try to do it ourselves because we watch tv shows with professionals and we think that we are inferior to their skill, finances and experience. But, you make me think, ok, give it a try and see how it comes out. It beats waiting on someday, and meanwhile, I’ll get some skills and experience. Gorgeous room! Love the ottoman. You are one amazing and inspiring woman! You are amazing! I love following your blog because you are my inspiration. We own a 1954 rambler in Washington state and are in the looooong process of remodeling it to make it wheelchair accessible for my husband. Our first big challenge has been making the front entry accessible. Next is an accessible master bathroom, then the kitchen (he likes to cook). Thanks again for posting your projects! Excuse me…How tall are you? Lady, I’ve seen grown football sized men cry and complain about things that are not even half as serious as the problems you inherited with this house! You really need a show on HGTV! Heck this house could be your show. Who would believe someone as tiny as you could do all that you’ve done! I am truly amazed! 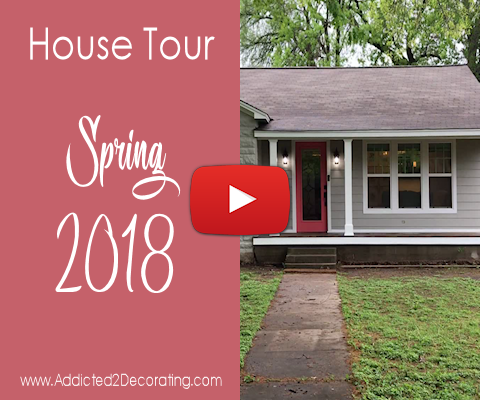 I can’t wait to see the rest of this house transformation. YOU ARE A REMARKABLE LADY! Happy New Year! Awesome job! I love decorating in stages, it looks more collected if everything isn’t bought at the same time! Keep it up! Love your blog! Where did your fireplace come from? I thought I had read all of your blogs but I don’t remember reading anything about a fireplace. I would love one just like it. It’s not a fireplace. It’s a credenza. 🙂 I will have a fireplace in here eventually, but it’ll probably be next winter before I can make that happen. I guess I should wear my glasses. On looking closer I see the knobs. Thanks for the prompt reply. I’m applauding. Can you hear me? The ottoman/coffee table is a great piece!! (Thanks for the DIY instructions too–I just spotted that.) Your room is so different from the day you first laid eyes on it. I don’t know how you do it, but you manage so much in so little time. Can hardly wait to see what the new year will bring! Just make sure you keep your windows in good shape! I have been following this guide for a while now and it is definitely making a difference. Love, love, love everything you’ve done. You’re an inspiration (okay you’re making me a little tired). That ottoman is perfect, your furniture building skills are remarkable. Have you decided what fabric you’re putting on the sofa yet? I haven’t. That sofa is really giving me trouble. I’m tempted to just buy a new sofa for this room and save this sofa for the family room when we finally do remodel the sunroom into a family room in the future. But then that would be taking the easy way out. I don’t like doing that. 🙂 So we’ll see. I was wondering about the sofa, too. Can’t wait to see what you decide on! The condo is beautiful! For a temporary fix, there are several companies out there that make pretty nice sofa covers. Maybe you could find a color you like that would fit that sofa until more $$ is available to get the fabric you want to cover it? The person I’ve always used to make slip covers for me (or rather, for clients in the past) would charge about $400 to make a slip cover, and that doesn’t include the fabric. :-/ He actually charges more for slipcovers than he does for upholstery. Wow! You have really gotten a lot done. You deserve a week off. The living room looks great – though I think I really liked your first option where the chairs were on the left…. I absolutely LOVE your curtains/shades. You did a great job. I wish you and your hubby a Happy New Year!!! Can’t wait to see the projects you work on in 2014. It’s looking good! You’re really getting there! I love those lamps! I have to have them!!! I have looked online, but cannot find them. Suggestions? Please, please, please :). The new look is indeed a very beautiful. By applying proper guidelines and with creative ideas one can turn a living room into a beautiful place.